Bruno Paillard is the youngest Champagne House by far. They were established in 1984, although Bruno started selling Champagne under his own brand in 1981,and the family has been involved as growers and brokers since 1704. A new Champagne House hadn't been started in close to century, but as the story goes 27 year old Bruno sold his Jaguar in 1981 for about 15000 Euros to finance his dream. His first Champagnes were made in a rented cellar from carefully selected grapes from independent growers. He now owns over 26 hectares of grapes, enough for 1/3 of his needs, including 12 hectares of Grand Crus. The rest of his grapes come from independent growers he has partnered with over the long term. Bruno Paillard Champagne today makes 500,000 bottles a year and exports to 40 countries. Sustainable viniculture, with plowing to avoid the need for chemical weed killers is practiced. Each parcel has its soils and leaves analyzed separately so each can be handled according to what suits it best, with manual harvesting at dates chosen individually for each parcel. That is a lot of work as he owns nearly 50 parcels of vines. Each year, any grapes not up to quality are downgraded and used for another label, only the first pressing of grapes, the highest quality, are used (many houses also use the second pressing), each cru is vinified separately to allow for much more control and flexibility in blending the final wines, and all of the wines have very low dosage or added sugar. The disgorgement date is listed on the back of every single bottle, a practice I wish more producers followed. The majority of the wines ferment in stainless steel tanks although for some vineyards small oak barrels are used. Malolactic fermentation is allowed to occur naturally. Wines are aged much longer than required by law, from 3 years for their Non Vintage wines (which they interesting call Multivintage Wines) up to 15 years for some of their vintage wines. 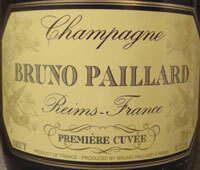 Bruno Paillard Brut Premiere Cuvee - their flagship wine and 60% of their production (see tasting note below). It is comprised of 45% Chardonnay, 33% Pinot Noir and 22% Pinot Meunier with 20% to 50% older reserve wines blended in each year and aged for over 3 years before being released. Bruno Paillard Rose Premiere Cuvee - 85% Pinot Noir with the rest Chardonnay, this is a very light colored Rose and comes in a clear bottle to highlight its delicate color. 10-15% older reserve wines are blended in each year, and it is aged for 3 years before release. Bruno Paillard Blanc de Blancs Reserve Privee Grand Cru - 100% Chardonnay from the Cote de Blancs, with less yeast added for the second fermentation that their other wines to preserve the Chardonnay's delicate flavor. 20-25% older reserve wines are blended in each year. Only a few bottles are made each year. Bruno Paillard Millesime Assemblage - made only in great years, a blend of Chardonnay, Pinot Noir and Pinot Meunier, percentages varying depending on the year. An an example, the 1999 is 29% Chardonnay, 42% Pinot Noir and 29% Pinot Meunier and was aged 9 years before release. Bruno Paillard Millesime Assemblage - 100% Chardonnay, from various vineyards depending on the vintage, and made only in the best years. Bruno Paillard Nec-Plus-Ultra (N.P.U.) - an attempt to make the best Champagne possible. All Grand Cru vineyards (and only Cramant, Chouilly, Mesnil-sur-Oger, Bouzy, and Verzenay), phenomenal years only, half Chardonnay and half Pinot Noir fermented in small oak barrels, and long aging before release. On the palate, a great balance and very elegant. Light to almost medium weight. Green apple, a touch of orange, and lemon curd. An absolute joy to drink!